Researchers at the Medical Research Council's Prion Unit at UCL have identified a naturally occurring variant of the human prion protein that produces resistance to prion diseases such as Creutzfeldt-Jakob disease (CJD). The findings, published in Nature, could give important insight into other human brain diseases that lead to dementia. Prions are infectious agents that cause invariably fatal brain diseases such as CJD in humans, scrapie in sheep and BSE (bovine spongiform encephalopathy or 'mad cow disease') in cattle. 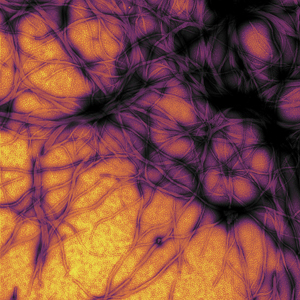 They are a rare but important cause of dementia and it is increasingly recognised that the fundamental process involved in these diseases - prion proteins changing shape and sticking together to form fibres or polymers that damage the brain - is also what happens in the much more common dementias such as Alzheimer's disease, Parkinson's disease and other neurodegenerative diseases. Over many years, the MRC Prion Unit at the UCL Institute of Neurology has studied a prion disease called kuru which at one time was widespread in a remote area of the Papua New Guinea highlands. Kuru is caused by the same strains of prions that cause CJD and was spread in a community - the Fore - who used to consume their dead as a mark of respect at mortuary feasts. This led to a major epidemic of this prion disease which, at its height in the late 1950's, caused the death of up to 2% of the population each year. One of the studies the MRC Unit was performing, in collaboration with colleagues at the Papua New Guinea Institute for Medical Research, was to identify people from the worst affected area who had been exposed to kuru but had survived many years after the last mortuary feasts occurred in the late 1950's. It was thought that these people might be particularly resistant to kuru, perhaps as a result of genetic changes, and identifying and understanding such changes could give important clues as to how to stop or treat CJD too. This is a striking example of Darwinian evolution in humans - the epidemic of prion disease selecting a single genetic change that provided complete protection against an invariably fatal dementia. The MRC Unit found a change in an important gene - the prion protein gene - in some of the survivors that looked as though it might protect individuals against kuru - an example of human evolution in action. To test this, the MRC Unit bred genetically engineered mice that had the same genetic change. The effect of this genetic change was to change just one of the 253 building blocks or amino acids that make up the prion protein. Remarkably, they found that these mice were 100% resistant not only to kuru but also to all forms of CJD, including the form known as variant CJD caused by human infection with BSE. It had previously been thought that the Fore, had cannibalism not been stopped in the 1950's, might have died out - some villages had almost no women of child bearing age left. However, it now looks as though they might have re-populated with people carrying this protective gene. If scientists can now understand how this single change in the prion protein prevents it changing its shape and becoming a prion, they could gain new insights into how to prevent not only CJD, but other dementias caused by chains of misshapen proteins. Dr Emmanuel Asante, who led the team that produced the mice, said: "From the human genetic work the Unit has carried out in Papua New Guinea we were expecting the mice to show some resistance to disease. However, we were surprised that the mice were completely protected from all human prion strains. The result could not have been clearer or more dramatic." Professor John Collinge, the Unit Director, who leads the kuru research programme, said: "This is a striking example of Darwinian evolution in humans - the epidemic of prion disease selecting a single genetic change that provided complete protection against an invariably fatal dementia. Much work is now ongoing in the MRC Unit to understand the molecular basis of this effect which we expect to provide key insights into how seeds of other misshapen proteins develop in the brain and cause the common forms of dementia, thereby guiding us to new treatments in the years ahead."